These last few weeks have been tough. There’s no reason, except for the rising mists of depression that have been circling my feet. Depression doesn’t need a reason. It’s been a good few years since the black dog really bit a chunk out of me. I live with anxiety and panic, but I’ve kept depression at bay. When it began swirling about my feet a few weeks ago it was unexpected, though not surprising. Depression is an illness you know can and often returns without warning. I’m currently still in the early stages of an episode and I’m fighting. I’ve used many methods to overcome depression over the years, including medication and therapy. This time I’m hoping to quash it naturally before it has the chance to develop. Anything that makes you feel good helps, so I’m storing the good things like sunsets and clouds. I can escape when I watch clouds and escaping into my imagination always gives me somewhere to go when darkness attacks. The ocean is another of my go to places. The ocean heals me. It calms my troubled mind and lifts my soul. A calm sea is a balm and a rough sea ignites my passions. Talking of water, another way I fight depression is to swim, which I’ve blogged about before. Powering through the water uses energy, is relaxing and exercise has been proven to help fight depression. Walking is exercise. On days when I can’t get to the gym, I can walk through woodlands, meadows, and the countryside. My German Shepherd gives me reason (if I need it and sometimes depression can kill motivation) and we walk every day. I live in a gorgeous area and we can discover adventure together beneath the canopy and fresh air. Sunshine and smiles. Smile and you feel better. Simple. Sunshine also gives the feel good factor right along with vitamins. Don’t forget we need sufficient hours of daylight to fuel and charge our bodies. Mountains, valleys, woodlands, forests…nature’s kingdom leaves me in awe and that’s always good. Get out there and enjoy the boost Mother Earth offers for free. Watch the birds soar, and let yourself escape! I adore trees, and they remind me how to grow, tall and strong. Climb one if you want, feel that sense of achievement, as long as you don’t get stuck! Enjoy nature’s fruits, eat natural and healthy. I love our apples! Like I said earlier, Autumn is my favourite season, so the turning leaves both inspire and humble me, and make the perfect atmosphere to fight the darkness. Flowers. I’ve blogged lots about flowers, nature’s decoration, her jewels. The scent of jasmine, or orange blossom, or roses and lavender inspire and rouse and lift me. So, I’m fighting. I’m getting out there and inhaling September, breathing in the beauty of nature and letting it infuse and heal me. So tell me what helps you overcome life’s difficulties? 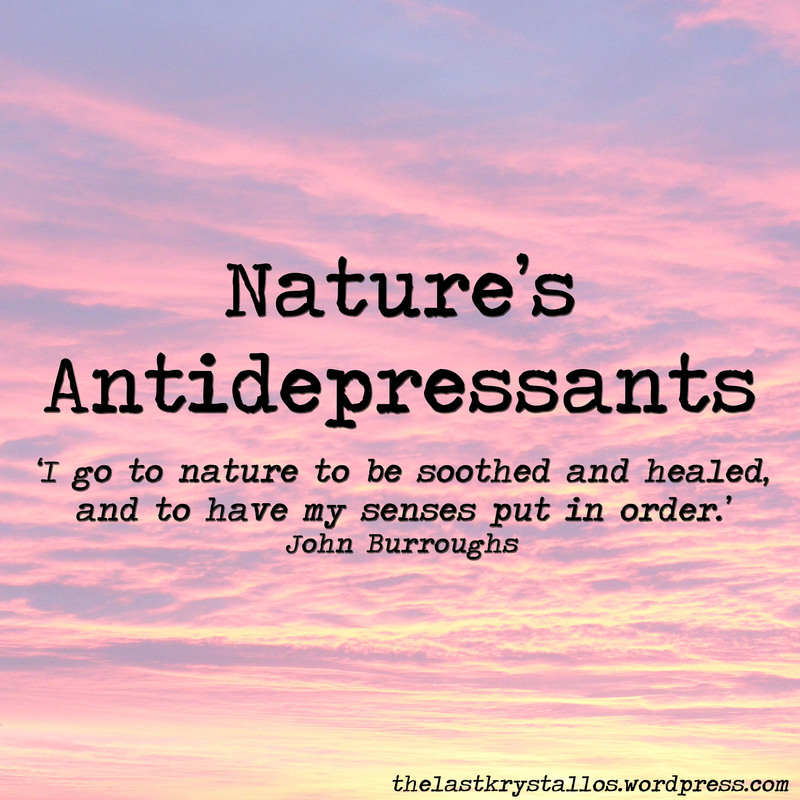 How do you allow nature to heal you? *It’s important to note that while nature can be a powerful prescription, if your depression intensifies, please seek help from your GP. Medication has its place and if used correctly can work wonders. This entry was posted in Depression, Emotions, Mental Health, Nature and tagged animals, antidepressants, Anxiety, birds, clouds, countryside, daylight, depression, exercise, flowers, fruit, light, natural, nature, Ocean, smiles, sunset, sunshine, trees, walking, woodland on 16th September 2015 by Lisa Shambrook. I feel calmed just reading your post. Such beautiful pictures too. Nature is an amazing healer, it uplifts and yet calms, invigorates and yet soothes, and it helps to bring balance. I hope your woodland wanders bring you some healing. Wonderful post, Lisa. Nature, I feel calms the soul. My husband and I travel, RVing around the country. I feel it is one of the best ways to keep depression at bay. Such a beautiful post, Lisa. Thank your for sharing it. I’m with you all the way that nature is the great healer. Being outside with a dog is the best therapy there is. Thanks, Sophie, Roxy gives us a reason to get out there every day!